July seems to be the month for history camps. 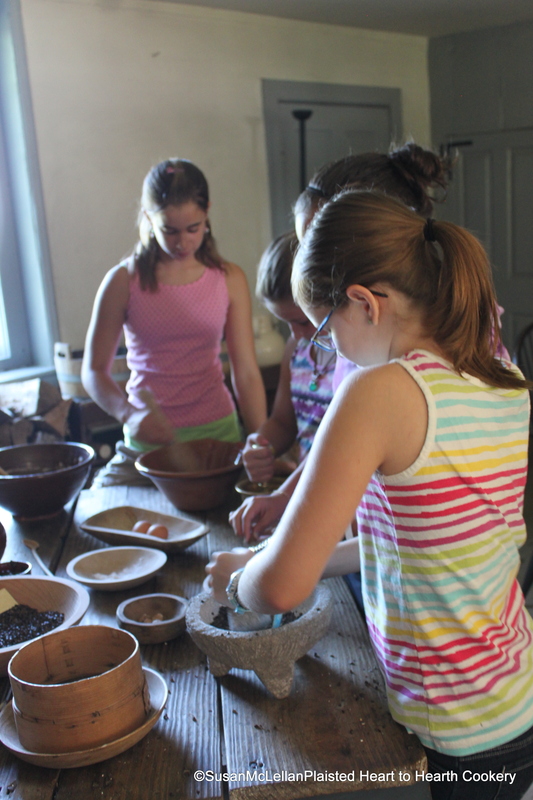 It is a pleasure for me to work with children at the hearth and have them use my food history tools. In this picture, I have four young ladies very intent on whisking an egg with a birch twig whisk, preparing salt in a brass mortar and pestle, grating nutmeg and grinding flour. I think back to when my interest in cooking, food, and food history really started-it was before I was ten years old! These experiences create memories that provide an association with the sources of food, an appreciation for antiques, and maybe just perhaps-another future food historian! Hurrah for educating the next generation! Such a noble pursuit, and so true about life long interests.